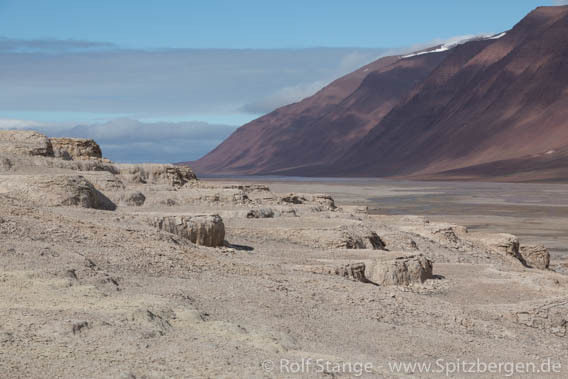 It is great to be out for a full, long day in Spitsbergen’s beautiful nature. And the warm springs far inland in Bockfjord are fascinating. A great destination for a long hike! We spend hours getting there, hiking across tundra with plenty of flowers and a river plain that looks like kind of a wadden sea. After an extended rest with some food, we have soon reached the fields with the sinter terraces. Nature has indeed created some very impressive pieces of art here! All this comes with a stunning background: a mighty wall of dark-red mountains, some huge moraines and rugged mountains. We enjoy the scenery, the weather, the hike and life in general for a full day. It is a timeless place. We are back on board after 9 hours. Of course there was also the option for walks within a „normal“ scale. 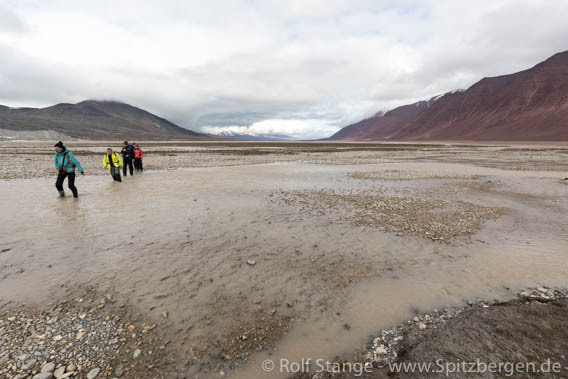 There are also warm springs close to the shore, and another walk went to a nearby glacier. The weather forecast is promising for the far north, so we set course northeast in the evening.